Malaga airport has begun using a new technology that will allow passengers to access the security controls over the automatic reading of data codes sent to mobile phones by the airlines that use this system. To this end, seven code reader devices were installed in two main areas of security filters on the airport grounds, five of them at controls of the Terminal 3 and the other two remaining one in the access control of the Terminal 2. The objective of this technological solution is to make the passage of travelers through the airport facilities more comfortable, speeding up access to security control, the point where the user can now pass through the mobile boarding pass code reader devices for validation. The seven devices facilitate the reading of data codes that airlines send to mobile phones of passengers checking in via their websites. 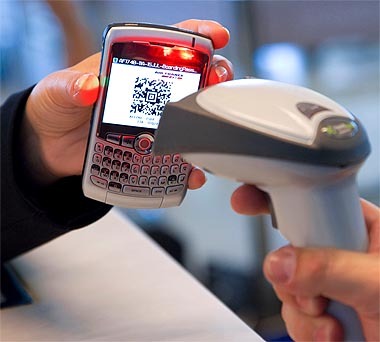 The 2D barcode is a standard approved by the IATA (International Association of Airlines) for airline tickets and boarding passes (replacing the magnetic stripe of current documents) and its use together with web billing and sending of confirmation to the passenger’s mobile phone, will in the future lessen the use of paper and reduce the time from arrival at the airport to boarding the plane.